The article “Obama orders steeper cuts from power plants” described how the EPA’s proposed limits on carbon pollution could cost $8.4 billion annually by 2030. The Citizens’ Climate Lobby (CCL) has a better way, a Carbon Fee and Dividend, which would produce deeper cuts in pollution in a shorter time. CCL’s proposal would place a fee on carbon at the source, and market forces would then encourage reduced emissions, energy conservation and investments in renewable energy. The carbon fee is not a tax and it would not raise taxes. The money collected would be distributed equally to every household as a monthly energy dividend. CCL’s legislative proposal would set an initial fee on carbon at $15 per ton of CO2 or CO2 equivalent emissions. The fee would increase by $10 each year until the CO2 emissions were reduced to 10% of the 1990 US levels. To protect American businesses and agriculture, adjustments at the borders would be made on exports and imports by the US State Department to ensure fairness. The carbon fees would be collected by the US Treasury Department and rebated 100% to American households, with each adult receiving a dividend and each child one half dividend up to a limit of two children per household. A similar Fee and Dividend policy is successfully working in Canadian British Columbia. In 2008, BC enacted a revenue neutral carbon tax which set an initial rate of $10 per metric ton of CO2 equivalent emissions, increasing by $5 per year until it reached $30, which it did in 2012. The revenue went straight back to taxpayers as tax reductions with a tax credit paid to low income households of $115.50 for each parent and $34.50 per child annually. The tax raised the price of gasoline by about $0.25 per gallon and the price of coal by about $60 per ton. Though there were winners and losers under the BC plan, it’s GDP grew in relation to the rest of Canada’s. British Columbia gets most of its electricity from hydroelectric power, so it is difficult to estimate the effect it had on the price of electricity. There are now no coal-fired plants in British Columbia and the consumption of fuel there is now 19% below that of the rest of Canada. In the US, all the money collected from the carbon fee would be distributed to US households as a dividend – which would effectively stimulate the economy. President Bush’s Economic Stimulus Act of 2008 provided a $600 rebate to each household. A 2012 study by Christian Broda found the increase in disposable income was an effective stimulus to the economy. President Bush’s stimulus, however, was only for one year and the money came from taxes. CCL’s proposal does not come from taxes, and a $30 per metric ton fee on CO2 is estimated to provide about $876 annually per person in the US. 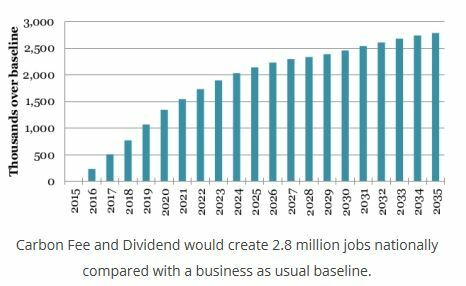 Though the price of gasoline and fossil fuel generated electricity will certainly go up, it will be offset by the dividend. People who reduce their energy consumption, or choose lower cost renewables, will be able to increase their disposable income by saving more of their dividend. The CCL Fee and Dividend proposal has a wide range of supporters such as notable climate scientists James Hansen, Katharine Hayhoe, and Daniel Kammit. It has the support of both conservative and liberal economists such as Gary Becker, Gregory Mankiw, Art Laffer, Nicholas Stern, and Shi-Ling Hsu. CCL’s advisory board is bipartisan as it includes George Shultz, former Secretary of State under Ronald Reagan, conservative former US Representative Bob Inglis (R-SC), and RESULTS founder Sam Daley-Harris, who is an advocate for solutions to poverty. A study by Regional Economic Models Inc. found CCL’s proposed carbon fee and dividend would achieve better pollution reduction than regulations while adding 2.8 million jobs to the economy over 20 years. What could be a better way to reduce carbon emissions? Credit: Darrel Hart, Wichita CCL leader, who helped greatly withthe editing. This entry was posted on Friday, August 21st, 2015 at 8:22 pm	and is filed under Energy and the Environment, Uncategorized. You can follow any responses to this entry through the RSS 2.0 feed. You can leave a response, or trackback from your own site.